in so many words...: Happy Thanksgiving! 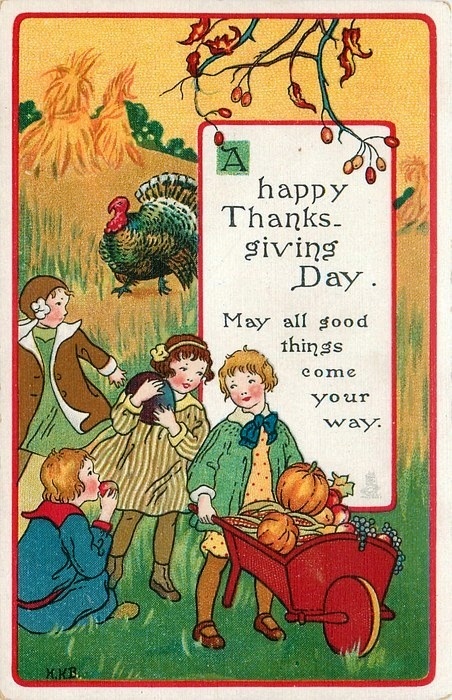 I love that card, especially as the turkey looks like he might be thankful not to be in someone's oven! Happy Thanksgiving, Yvette. I'm thankful for bloggers like you! a Happy Thanksgiving for you also. A very happy Thanksgiving to you! One of the things I'm thankful for is this blog. I love that illustration! Is it from a book? Thanks for the good wishes, Yvette, and I know you will be having a good time too. Happy Thanksgiving,Yvette. Enjoy your break. Thanks, everyone. I had a really good Thanksgiving - lots to be thankful for. Hope you all did too. Nan, I believe the illustration is from an old card. Rick, what a nice thing to say. I love this time of year - don't you?